Preschool-age children are learning a lot! From potty training to controlling their temper, they are discovering what is expected of them and trying to do their best. Parents can encourage good behavior by setting up a reward system that is sure to get their attention. Why Is a Reward System Important for Preschoolers? Here's the thing about preschoolers. They like to do things their own way on their own time. 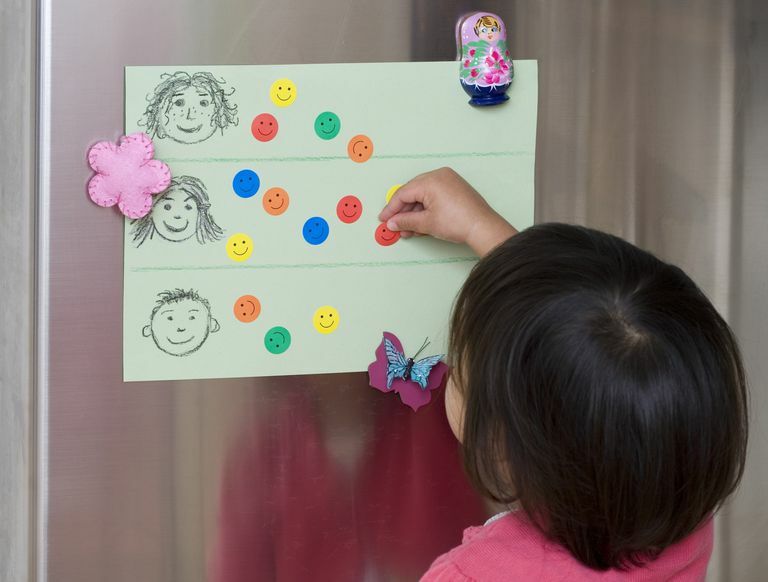 So when you want to encourage a new behavior — potty training, doing simple chores, or something of the like — a great way to do it is to set up a reward system. A positive form of discipline, a reward system for children does not have to be complicated. It can be as simple as stickers on a chart or buttons or beans in a jar. Whatever method you choose, the object is to keep track of good behavior so your child will continue acting that way in the future. 1. Explain the concept to your preschooler. Before you start, talk to your preschooler about what it is you'd like him to strive for. In my house, it was getting my three-year-old to pull up his own pants after he went to the bathroom. For others, it may be how many days she can go without a temper tantrum or for every meal she is able to clear her plate. Whatever the behavior, explain to your preschooler what you are looking for and what the ground rules are. 2. Set ground rules. In our case, my son could earn two stickers each time he went to the bathroom — one for pulling up his underpants and one for pulling up his pants or shorts. He had to pull them all the way up in order to earn his prize. Talk about what it is you want your preschooler to do and what she needs to do to succeed. Some parents like to offer a grand prize — fill up the bean jar or earn 25 stickers and the child gets an additional reward. Do whatever works best for your family. 3. Create a reward system. Get your preschooler in on the process. Gather up posterboard or cardboard, a jar, or whatever you are using, as well as markers and stickers and let your preschooler decorate. If you are making a chart, make sure the tallying method is clear so it is easy to keep track of any rewards your child earns. 4. Try to focus on one or two behaviors at a time. You may have a litany of things you want your preschooler to work on, but it's a good idea to tackle only one at any given time. If you are potty training and working on sticking to a bedtime routine, consider putting adding chores to your preschooler's schedule on the back burner. Having too many "to-do's" on your preschooler's list can be confusing (for you and him). It can also lead to many reward charts decorating your walls (although you might save money on the wallpaper!). 5. Payout perks promptly. Here's the key to a successful reward system — it must be immediate. Whether you choose to use a sticker chart or beans in a jar, make sure as soon as your child does the target behavior those stickers or beans are in hand and ready to go. When they go on the potty or get through a meal without a temper tantrum they can be duly recorded. Most preschoolers have no real sense of time yet, so by offering the sticker up right away, you are confirming their good behavior and encouraging them to do it again. 6. Be consistent. In the same vein as being prompt, you need to make sure you are consistent in handing out awards. And don't give one out if your child hasn't done the targeted behavior.